On Friday I tried a mid-distance ride with a lot of climbing, leading me to various places previously unconnected by one continuous ride. As per new riding doctrine, I rode up to Nakayama station on the Yokohama line and took a train out to Hashimoto. This helps me to avoid the boredom of the Tamagawa, the Kan One and other roads ridden so often, so far. It is only 7 - 8 km through Hashimoto and then one is at the Tsukui Ko North route which is a good start for a longer ride. I decided to give Doshi Mishi a try, it has been a while since I have ridden there with Ludwig and it has this continuous but not too steep climbs which I was looking for in order to improve my performance. 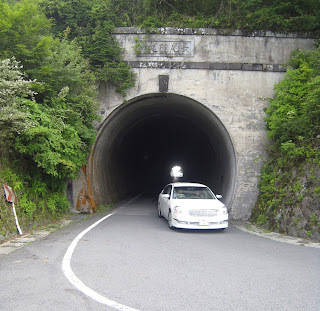 And also I wanted to start a new Toagebaka which leads from Mikage crossing on route 413 to the entry of the tunnel on Dochi Michi at it's highest point just before Yamanaka lake. I was not very fast. In fact I overtook a hobby rider on his Cannondale bike and was overtaken by him again after 5 kilometers or so. My legs are OK and I have stamina to function on longer rides, but the speed is much too slow. In short, a performance disaster and the wore humiliation since michael and me got (almost) dropped by a one legged rider on Kan One. So it took me almost 2:40 hours for less than 40 km of distance and 900 meter elevation which is now recorded as Togebaka No. 13. Please try to break this record, it shouldn't be that difficult. ROAD 138 - TO BE AVOIDED. Boring, a lot of traffic leading to the Tomei highway. Moreover, because of the nearby SDF training camp a lot of military vehicles on the road. 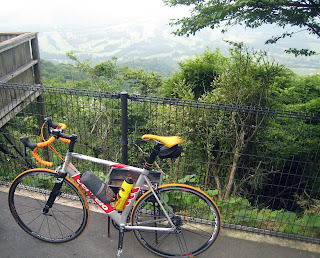 My plan was to ride up to Lake Ashino / Moto-Hakone from there and as I still felt OK I gave it a try. Luckily there is road #401 forking off from 138 so I gave it a try. This was a good decision as the road was almost empty and the climb very gentle, hardly more than 5% slope in any location. 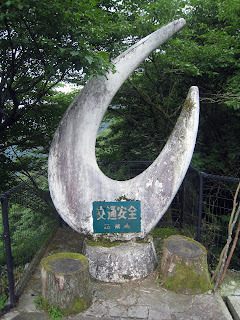 And so I made it to the top at Nagao something tunnel where I discovered a monument to traffic safety in sorry state. When you are driving your car, autobike or bicycle, you should always be aware that if you act against traffic rules, there is a slight chance that the ground will open next to you and that these pinchers will appear, screaming and shaking in anger and they will grap the sinning you and drag you down to a place deep below the surface of earth where you will be tortured to no end by retired police officers in traffic psychologic training classes. For a first hand experience I recommend the lectures at the Samezu driving licence office. Anyway, I rode along further, back to road 138 and then to road 75 which should have brought me quickly to the shores of lake Ashino. So a last climb and then I would coast along the lake. Hm, I was already way higher than the lake but I thought, OK, this is the ridge I need to take before coming down to the lake and finally I did. The road there by the way looks like a sign monument to corporate Japan: Nissan, NEC, IBM Japan, Kawsaki Shinko Ginko ... a lot of famous companies seems to have their resort or seminar houses up there. Judging from the state of some of the resorts, it seems to me highly probable that the company itself will be in a similar shape pretty soon. Maybe this would make a good indicator, similar to the idea of the McDonald index for countries. Anyway, so I finally descended to the lake and was looking forward to a short ride to Moto Hakone. But what was that? The road made a 180 degree turn and led me up to the ridge again! From there it was a constant up and down and down and up until I have finally reached known ground at route one. ROAD 75 IS A BLOODY ELEVATION-METER VAMPIRE ! I ten took a final break in Moto Hakone, please take a close look at the attached Mapmyride link to check WHERE exactly I have made the break. So finally I decided to take route 20 down to Atami. Of course it was wonderful, route 20 is so beautiful, so nice and gentle, it seems one can ride there forever at 40 - 50 km/hr an hour and never brake. The bike moves perfectly through all the curves, rarely disturbed by traffic and it feels like moving your hand slowly down the spine of your girlfriend a long time ago. Sorry, couldn't come up with any more actual example. But all this comes to an end at Atami Toge where the final kilometers to Atami have to be conquered in almost free fall fashion. I am still lacking power and grip in my left hand so it was a real torture. The beauty for me is that the Shinkansen takes me home from Atami to Shin-Yokohama in 30 minutes and then I assemble the bike an ride home which is perhaps another 30 minutes. So I just made it in time for the dinner. Looking forward to the Sunday ride now. Nice ride. Like you, I have done most of the pieces, but not in one go. Nagao-toge is indeed very nice, especially the view down into Ashiko. TCC Thomas and I did that some time ago - photos on the TCC blog. And yes, the road "by" the lake is a lot of up and down, but nonetheless quite nice. I have done it in reverse direction when cycling from Shuzenji via Atago-toge, Moto-Hakone, the lake to Odawara.